In a 3 1/2- or 4-quart slow cooker, combine tomatoes, eggplant, zucchini, celery, onion, parsley, raisins, tomato paste, vinegar, brown sugar, salt, and pepper. Cover and cook on low-heat setting for 5 1/2 hours or on high-heat setting for 3 1/2 hours. If desired, stir in olives and/or capers. Serve warm, cold, or at room temperature. Makes 6 cups. To prepare the caponata conventionally, preheat oven to 325 degrees F. Meanwhile, in an oven-going Dutch oven, heat 2 tablespoons oil over medium heat. Add celery and onion; cook, covered, for 10 minutes, stirring occasionally. 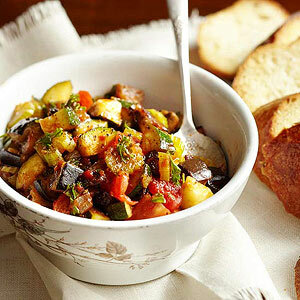 Stir in tomatoes, eggplant, zucchini, parsley, raisins, tomato paste, vinegar, brown sugar, salt, and pepper. Bake, covered, about 2 hours or until vegetables are tender. If desired, stir in olives and/or capers.